For $350, Canon’s PowerShot SX200 IS serves up a heaping helping of camera. The marquee feature in this point-and-shoot is its 12X optical zoom lens, which reaches from 28mm on the wide-angle end to 336mm on the telephoto end. That alone is a major selling point for this camera, and it just gets better when you factor in its image quality and fun features. To get this kind of power in a fixed-lens model a little over a year ago, you needed to buy a megazoom camera that was nearly the size of a digital SLR. These days, the SX200 IS represents a growing trend among point-and-shoot digital cameras: high-zoom models (10X optical and above) that are merely a bit bigger than average compact cameras but still stowable in a bag, purse, or large pocket. The SX200 IS is certainly bulkier than a typical point-and-shoot; it looks like it just ate three ultraslim cameras for lunch, and the body is big enough to accommodate a roomy, 3-inch LCD screen on the back. The display is sufficiently bright for composing shots in sunlight, but in direct sun the on-screen colors were a bit hard to distinguish. When you zoom in to the full extent of the SX200 IS’s 12X-optical-zoom lens (the circumference of the lens is about that of a can of Red Bull), the result can look downright comical: The lens is about twice as long as the camera is deep (1.5 inches). The “IS” in the camera’s name stands for image stabilization, a must-have feature in a camera whose main skill is zooming; when you zoom in, camera jitter becomes more exaggerated, which can create image blur. Canon point-and-shoots normally have excellent optical image stabilization, and this model is no exception. It did a good job of keeping shots steady, except in extreme situations when I zoomed in to the full extent and shook the camera dramatically. The SX200 IS handily corrected jitter produced by normal, shaky hands; shots were clear and sharp, even at maximum zoom. The SX200 IS’s pop-up flash helped it score very well on flash exposure in our image-quality evaluations. While the flash performs nicely and looks retro-trendy, a couple of things bothered us. First, when you turn the camera on, your left index finger can get in the way of its popping up. Second, opening and closing the flash is a fully electronic process; you can’t just click the flash closed with your finger. In our lab tests, the SX200 IS earned particularly high marks for lack of distortion, for exposure quality, and for color accuracy. The camera also did well in flash-exposure quality. Overall, the SX200 IS earned an imaging score of Very Good. Battery life also rated as Very Good. In our lab’s battery tests, the SX200 IS took 324 shots on a single charge of its rechargeable lithium ion battery. For a camera of this size, the ability to use AA batteries would have been a nice option. Oh, and it gets better. You can shoot HD video in both of those modes, making for instant art-school films with no post-production work necessary. The SX200 IS shoots 1280-by-720 HD video at 30 frames per second (it also shoots 640-by-480 and 320-by-240 standard-definition clips at that frame rate), and it offers an HDMI-out port so that you can show your clips on an HDTV set directly from the camera. Unfortunately, you can’t use that whopping zoom while you’re shooting video. 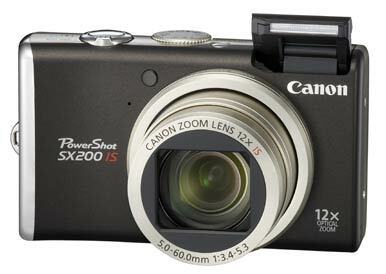 The PowerShot SX200 IS has a 3-inch LCD. You get all the old standby scene modes, too: fireworks, snow, foliage, sunset, night-scene, beach, and aquarium modes are all in the mix. Also handy is the Stitch-Assist mode, which guides you along the way to making a panorama shot by showing the right half of the last photo you’ve taken. You just overlap your next shot with that image and then download your images to a computer, and the included PhotoStitch software (for both Mac and Windows) takes things from there. Included as well is an ISO 3200 scene mode for low-light, no-flash shots-however, noise was very visible in our low-light shots taken in that setting. Manual ISO controls, ranging from 80 to 1600, are also available, and results were much better in that range; a bit of noise crept into shots at ISO 800 and 1600, but low-light images were surprisingly sharp. One helpful design touch: Most of the SX200 IS’s main features are accessible via a mode dial on the top of the camera. You still have to do a bit of on-screen navigation to access the contextual settings for each mode, but having auto mode, easy mode, manual mode, aperture priority mode, and shutter priority mode accessible with a turn of the dial was a time-saver. Some frequently used scene modes-portrait, landscape, night-portrait, party, and pet mode-are accessible through the mode dial, as well. You access all the other scene modes by choosing SCN on the mode dial and then using the on-screen menu to select them. The controls layout is familiar and easy to master: The power button, mode dial, and zoom ring/shutter button are all on the top of the camera. On the back, surrounding the circular navigation button and scroll wheel, are four buttons: a print button for PictBridge-compliant printers, a playback button, a display button for showing various settings (and hiding them) on the screen, and a menu button. You can press or spin the four-way navigation scroll wheel to select menu items, depending on the context; when pressed, the four navigational directions also double as one-touch access buttons for exposure compensation, the flash (on and off), macro mode, and the self timer. The HDMI and A/V ports on the side of the camera are covered by a gleaming, chromed-out plastic door. The door sure looks shiny and fancy, but it also feels a little flimsy when it’s opened, and its durability could be cause for concern over the long haul. Canon’s PowerShot SX200 IS is one of those rare point-and-shoots that is as easy to use as it is versatile, thanks to its intuitive controls, its big-time zoom lens, its addictive in-camera features, and its stellar image quality. We can’t find much to dislike about this camera. If you’re not put off by its bulkier-than-usual size, it’s a great buy for $350.